Geneva II Conference: Who’s at the Table? Inviting people to a party is not always simple. Besides the logistical problem of deciding exactly how many people should be invited and anticipating how many will come, there is the more subtle problem of anticipating who will get along with who. Are these people friends? Does this couple know this couple? Should we try to introduce this unmarried woman to this bachelor? Who should seat next to whom? And the list goes on. Democracy is not just a system of voting. It is based on the recognition that others have the right to decide what an entire population should do. In a democracy, those in the minority must accept the majority’s will. The minority accepts the majority’s decision hoping that sometime in the future the roles will be reversed. The End of the Arab Spring? With continuing tensions and violence in Egypt, a horrendous civil war in Syria with over a million refugees and internally displaced persons destabilizing neighboring countries, assassinations in Tunisia, a supposed plot to seize an oil port in Yemen, it is perhaps understandable for people to ask what has happened to the Arab Spring. Rather than answer that question directly, it would be better to revisit the so called Arab Spring itself. In other words, before questioning whether something has faded or died, it is important to understand what we are talking about in the first place. In his famous book, Orientalism, Edward Said argued that the Western world had created a vision of the Orient and the Middle East from a biased point of view. The Eurocentric vision, according to Said, helped justify what he saw as colonial or imperial activities by the West. By caricaturizing Arabs in a certain way, the West could sell weapons, extract oil, and invade in the name of the international community. Said’s central point is that Western academics and diplomats saw the Orient from their perspective and used it for their interests. Anti-American Uprisings: What is responsible? What is responsible for the outbreak of anti-American violence in the Muslim world? The obvious first answer is the reprehensible video. But, behind the video there are several theories being floated. Among them are: 1) The protesters are a street minority who do not reflect majority feelings. The distinction between populism and democracy is relevant here; 2) Democracy takes time. It is unreasonable to expect democratic values such as freedom of expression to be assimilated in such a short period of time; 3) A cultural clash is most evident. Western countries are attuned to criticizing and even mocking religious figures that are held sacred and beyond mockery by other cultures and religions; 4) The United States is associated with imperialism, often aligned with Israel. The violent outbreaks are a manifestation of a rejection of foreign intervention. Syria and the "International Community"
The United Nations has decided to suspend its observer mission to Syria. Because of increased violence and threats to the observers themselves, the monitors will remain in safe areas within the country but make no attempt to bear witness to the continue violence and increasing massacres. The observers had been sent as part of a six-point peace plan proposed by Kofi Annan as special envoy of the U.N. and the Arab League. While many commentators are announcing the failure of the Annan plan, a more profound failure is taking place. The United Nations was established to help maintain international peace and security as well as guarantee a minimum of human rights. Beyond the declarations of intended objectives was the notion of something called the international community. That community was supposed to represent a collective will, a collective sharing of aims and values if not minimally shared interests. As opposed to a coalition of the willing which assumes insiders and outsiders within and beyond states, the international community is a general term that was created to capture larger, recognized commonalities. Although it is perhaps best represented within international organizations such as the United Nations, the international community is a more encompassing term including civic society in all its manifestations. It is such a huge tent indeed that often when used it is difficult to imagine anything outside the tent. Over 100 people were massacred in Syria. Kofi Annan, United Nations and Arab League special envoy said, "I am personally shocked and horrified by the tragic incident in Houla...which took so many innocent lives, children, women and men". Arguments are raging in the United States about the withdrawal of troops from Afghanistan and Iraq; 6,000 service men and women dead, over $1 trillion dollars spent. To what end? What is tolerable? At what point do we say enough is enough and change behavior? President Obama, it appears, became disenchanted with his military advisors when they asked for more troops and more time in Afghanistan without being able to specify how much it would cost and without clear doable objectives. The civil war in Syria continues to rage with innocent lives lost every day. Even Russia, Syria's ally, has condemned the violence, yet there has been no fundamental change in behavior from the warring parties or the international community. In the April 2 edition of the International Herald Tribune, the global edition of the New York Times, Henry Kissinger wrote an op-ed piece entitled "Defining a U.S. role in the Arab Spring". (Disclaimers: Henry Kissinger was raised in the Washington Heights section of the Bronx; I was raised in the Van Cortlandt Park section, further to the North. We both have PhDs in international relations.) For a host of reasons, nothing Dr. Kissinger writes is without interest, and an examination of one or two of his assumptions is quite revealing. When Henry speaks, those in power listen, while those out of power merely deconstruct. As one of the more positive consequences of the Arab Spring, voters in Egypt and Morocco have recently exercised their right to vote. This was especially so in Egypt, where people waited in line for hours. The "chaotic celebration of democracy" saw polling hours extended because of the unexpected large number of enthusiastic voters. Long deprived of any form of empowerment, people formed lines of up to three kilometers outside voting areas with the massive turnout expected to see over 70% of eligible people participating. At the end of the movie Charlie Wilson’s War, a US government official leans over and whispers in the ear of the Texas Congressman, “We have a problem”. Wilson had been a fanatical supporter of the Mujahedeen in Afghanistan, a major force in having the US government supply the rebels with considerable weapons to help them throw out the invading Soviet army. The “problem”, as it were, was that the weapons were now in the hands of the rebel forces who, after the withdrawal of Soviet troops, were beginning to use them for their own ends, including working with the Taliban against the West. The transitional forces in Libya were supplied with considerable weapons to help them overcome the regular Libyan army. Paragraphs 9 and 10 of U.N. Security Council Resolution 1970 from February imposed a comprehensive arms embargo on Libya. But Resolution 1973, which was adopted in March and authorized military action against Libya, included language that some countries argue created a loophole in the embargo. “We decided to provide self-defensive weapons to the civilian populations because we consider that these populations were under threat," France’s Ambassador to the United Nations Gerard Araud told reporters in June. "In exceptional circumstances, we cannot implement paragraph 9 when it's for protecting civilians," Araud stated. The ragtag group that started in Bengazi would not have been able to defeat the regular Libyan army without the necessary military hardware, if not training. Weapons flowed to the rebels with little control to whom or for what. “Defeat Gaddafi’s troops” was the marching order, and nothing more. Weapons flooded to the rebels as they had to the Mujahedeen in Afghanistan. But what would happen to the weapons once the war was over? In certain countries, Nepal for example, when a civil war ends the handing over of weapons by the rebels can be part of a peace agreement. There are even those who believe that weapons should have numbers like cars so that they can be registered and followed. In that way, there can be some form of control. The West – I refrain from specific names beside the French who publicly admitted their actions – generously gave weapons to the rebels. Defeating Gadaffi was so important that it appears that no consideration was given for collecting or controlling the weapons after the Colonel’s defeat, including those weapons that had been taken from government arsenals. Why do I raise this issue? Rumors have it that many of the weapons used by the rebels have been stolen or shipped throughout the Maghreb and Northern Africa. Truckloads of material are making their way into the hands of the Al-Qaeda Organization in the Islamic Maghreb. This is what is often called unintended consequences; there seems to have been no check or control. But, the example of the Mujahedeen in Afghanistan should have been a warning of what not to do; a massive shipment of arms without control is an invitation to disaster. Once again, “we have a problem”. Although the rejoicing at the overthrow of the ruthless dictator is certainly merited, the consequences of the arms shipments does not bode well for the future of the entire region and beyond. Gaddafi: Chop Off Their Heads ? Assassinating political opponents has a long historical background. So long, in fact, that one of the ways we separate the modern from the pre-modern is the notion of elections as a means of determining rulers or courts of law as a means to deal with violations of accepted norms. Although the beheading of King Charles I of England in 1649 is considered the beginning of modern politics, this was only so because it meant the privileging of the Parliament over the absolute monarchy and followed a legal trial for tyranny. Modern politics is supposed to be beyond beheadings; the International Commission Against the Death Penalty (ICDP), which is against all legal executions, last week opened its offices in Geneva. How are we to understand the recent killings of Moammar Gaddafi, Anwar Awlaki and Osama Bin Laden in this context? You will certainly want separate explanations for each. Bin Laden, it is said, had attacked the United States and was plotting further attacks. Capture and trial were not possible, it was stated, given where he was and the immediacy of ending his potential terrorist capabilities. Awalaki also had attacked the United States in different ways and, although an American citizen, was thought to be a dangerous enemy in a country - Yemen - where it would have been impossible for him to be properly captured and brought to trial. Gaddafi was a tyrant whose death was cathartic for an entire population; no trial meant that the 42 years of dictatorial rule ended quickly. At his death, there were celebrations throughout Libya although the United Nations High Commissioner for Human Rights has asked for greater clarification about the circumstances surrounding his demise. The videos are gruesome; the displaying of his body in a refrigerated meat container a rejection of any form of human dignity no matter what he had done. We should expect more from those who overthrew him. The Arab Spring gave enormous hope throughout the region. Autocratic if not despotic rulers were replaced in Egypt, Tunisia and now Libya. Calls for empowerment have filled the streets. Elections are being held in Tunisia. Democracy is the rallying cry of the disenfranchised. But what does democracy mean if not the rule of law? When the young 13 colonies in the New World defeated the British, they offered their leader, George Washington, the possibility of being King. He refused, recognizing that the break with the monarchical past must be complete; the Revolutionary War for Washington meant a true revolution, a radical change from traditional practices. If cries for democracy are ringing throughout the world, then there should also be cries for the rule of law; one includes the other. Political assassinations should be a thing of the past. Although we may rejoice at the end of a dictator's rule, we should not rejoice at seeing a bloody body being dragged through the street or put on display. If it is heroic to take up arms to fight for democracy, it is equally heroic to fight for the rule of law at times of emotional outbursts. Neither expediency nor vengeance is an excuse for the primitive "Chop off their heads". And that goes for so-called advanced democracies as well. The Arab Spring brought hope to the Middle East and North Africa. People took to the street to protest autocratic if not dictatorial rule, many using social networks with a prominent role for the young. In Athens, Madrid and London, people took to the street to protest chronic unemployment, many using social networks as well with a prominent role for the young. Where has the United States been in all of this given its similar situation of millions unemployed? The jobless rate for high school graduates now stands at over 20%. While the protests of the late 1960's focused on the Vietnam War and civil rights, the recent populist Occupy Wall Street movement is focusing on the distribution of wealth. With official unemployment figures continuing to hover at 9%, people are protesting against the concentration of wealth associated with Wall Street's financial center. The Government bailed out large firms and banks too big to fail, but the tax money spent on them has not yet trickled down to the middle or lower classes. The TARP program has not led to increased lending or job creation while financers continue to receive huge salaries and bonuses. What began as a small protest movement in New York three weeks ago has spread to Los Angeles, Chicago and Boston and looks to be catching in other major cities as well as outside the U.S. Little formal organization is involved, with social networks like Twitter, Facebook and Google playing a major role. No political party is in the lead, although some labor leaders seem to be joining the movement. It is fascinating to compare this movement with those of the 1960's. There is no clear leadership now, no Tom Hayden, Mark Rudd or Mario Savio. There is no clear organization like Students for a Democratic Society (SDS) or ideological statements like the Port Huron document. There are no clear objectives either such as end the war in Vietnam or desegregation. There is anger at the radical inequality in the distribution of wealth; there is anger at the failure of the government to create jobs; and there is anger at the Wall Street firms for their inability to deal with the realities of Middle America. For the moment, neither the Republicans nor Democrats have reacted. No candidate has come forward within the two established parties like Eugene McCarthy with the Democrats; no third party movement has started. With the election of 2012 on the horizon, it is not yet clear how this grass roots movement will play into traditional two party politics. The Tea Party has become a major player moving the Republican Party to the right. Barack Obama's Democratic Party is long past being inclusive of populism. It is fascinating to see how a populist movement is developing in the United States after the Arab Spring and European demonstrations. In 1968, it was the other way around. In his long awaited speech on the Middle East in the midst of the Arab Spring, President Obama sounded frustrated about the lack of progress in the negotiations between Israel and its Arab neighbors. Positively, he spoke of change, of self-determination in the Middle East and North Africa, saying, "...shouts of human dignity are being heard across the region". But, he also said, "For decades, the conflict between Israelis and Arabs has cast a shadow over the region". Is that shadow to be removed? Beyond the President's frustration is the reality that Hamas and Fatah have reached an agreement, and that there is movement for the Palestinians to declare an independent state during the meeting of the United Nations General Assembly in New York in September, with many countries, including possibly France and England, formally recognizing Palestine. Countries can declare independence without universal recognition; Kosovo declared its independence with over 60 countries recognizing its existence; the Western Sahara is recognized by almost all countries of the African Union. The President described his vision of where the negotiations should lead: two states with permanent Palestinian borders with Israel, Jordan and Egypt and permanent Israeli borders with Palestine. He proposed that the borders of the two states should be based on the 1967 lines. Nothing was said about the thorny issues of Jerusalem and the return of displaced Palestinian refugees. The President's frustration pales in comparison to those who have lived and died during over 60 years of confrontation. Barack Obama recognized that the United States cannot impose peace on the region. Israeli Prime Minister Benjamin Netanyahu is in Washington and there is hope that the President will use whatever leverage he has to move the Israeli positions on settlements and Jerusalem. The Israeli reaction to the speech has been cold, if not icy. Netanyahu has snubbed the President before, and the upcoming Presidential election could influence how much pressure Obama will bring to bear. The September date is not a deadline, but it is becoming clearer and clearer that the clamor for democracy in the Arab world is part and parcel of the initiative for a Palestinian state. President Obama must recognize that he cannot seriously speak of change, human dignity and democracy without a just solution to the Palestinian situation, and, as he indicated in his speech, that means a Palestinian state. The death of Osama bin Laden is a major event, perhaps more important in its symbolism than in the reality of the end of Al Qaeda and terrorism. Ten years after the attacks in the United States, the "leader" of the group credited with the attacks has been killed by American forces in Pakistan. Bin Laden had been personified as the head of the Axis of Evil. But, that is to assume that the nebulous network called Al Qaeda was organized in a hierarchical structure as a traditional military organization. It is also to assume that the War on Terror was a traditional war against a traditional enemy who could be overcome by military force. Amid the chest-pounding satisfaction of the American people that justice has finally been done remains the fundamental question of what drove suicide bombers into the Twin Towers. The root causes of the terrorist acts around the world have been neither identified nor properly dealt with. The Israeli-Palestinian conflict remains a stalemate, with a forthcoming announcement of a Palestinian state in September looming on the horizon. Two questions about the death: 1) Why now? 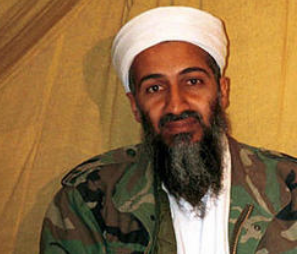 For ten years US forces unsuccessfully have been tracking bin Laden. It is perplexing that at the same time the US enters the political campaign for the Presidency, at the same time President Obama is changing his Secretary of Defense and head of the CIA, Bin Laden is found. And, he is found in Pakistan just outside Islamabad. Critics will see political motives, especially as President Obama took full credit for the control of the operation as Commander in Chief. What better way to seem presidential just before an election than to have a military victory. Forget unemployment, forget the deficit, I am in charge! How will this effect terrorism in the future? At the same time the President announced the news, he also warned citizens to be vigilant. It could be that the killing of Bin Laden will set off a wave of terrorist activity as surprising as the recent bombing in Marrakesh. Violence begets violence, and revenge is not limited to only one side. The War on Terror was a mistake to begin with. If the death of Osama bin Laden ends that War on both sides, whether in reality or symbolically, then so much the better. As a non-expert on the Arab world, how is one to understand the different clashes taking place in North Africa and the Middle East? Perhaps the easiest answer would be to say that each scene of rebellion, discontent and uprising is very different and highly contextual. Each country has its own history; Tunisia is not Egypt, Egypt is not Syria, Syria is not Libya, Libya is not Yemen. Yet, outbreaks have taken place across the region, with striking similarities beyond the obvious. Autocratic rulers have been removed; others are being challenged with varying degrees of success and violence. There is something going on here that is profound. I certainly does not help our understanding that a religious belief outside the Judeo/Christian tradition is playing a prominent role in much of the region. Is Islam compatible with democratization and modernity, if not a modern state system? This question has been debated and will continue to be debated within European countries, but it is now coming to the fore in the Maghreb and Middle East. Turkey is being frequently cited as the best example of a solution. Our secular societies are firmly based on the separation of Church and State, besides some obvious references in Constitutions and on dollar bills. Easter, like Christmas, has become more a holiday than a religious celebration. We observe what is going on; we try to understand. Perhaps we even try to interfere to save lives or to help a group that is favorable to us. But, for the moment, we are watching waves of activity that are like a tsunami causing huge destruction, and hoping that when the wave recedes the reconstruction will have something better than what was there before. It may even be more satisfying to ponder the tsunami "over there" than examine the potential earthquake ready to shake our economic basis at home.